Michael D. O’Hara was born on September 19, 1910, in Menominee, Michigan. He was educated at the University of Notre Dame and completed his post-graduate studies at St. Norbert College in Wisconsin where he was invited to become a member of the faculty. O’Hara is one of the last justices of the Court who was not a graduate of law school. 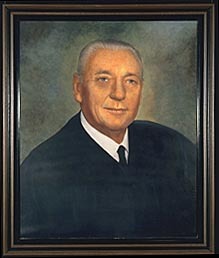 O’Hara studied law under the supervision of Leland Carr, who later became a Chief Justice of the Michigan Supreme Court. In 1935, O’Hara was admitted to the Bar and returned to Menominee where he went into private practice. In 1943, he became a Marine and rose from the rank of Private First Class to the rank of First Lieutenant. He saw action as part of the invasion force in Okinawa and was part of the occupation forces in Japan before he returned to Michigan. Upon his return, he became an Administrative Law Judge in the Unemployment Compensation Division. O’Hara was elected to the Michigan Supreme Court in 1962. His service on the Court terminated in January of 1969. For the next five years, O’Hara served on the Michigan Court of Appeals Bench. Michael D. O’Hara died in 1978. (Michigan Supreme Court. Michigan Reports: Cases Decided by the Supreme Court of Michigan. New York: Lawyers Co-operative Publishing Co., 1952 – 1998, Vol. 417).